On Wednesday, October 28, 2015, a Burlington County jury awarded $7,765,778.00 to former New Jersey Department of Corrections Sergeant Lisa R. Easley in a whistleblower lawsuit against the New Jersey Department of Corrections. Ms. Easley, 49 years old, alleged that she blew the whistle by cooperating with the FBI in their investigation of former Department of Corrections Deputy Commissioner, Lydell Sherrer, including wearing a wire and recording conversations. She was the only victim who provided names of other victims to the FBI. Sherrer is currently serving a sentence in federal prison for his extortion of numerous Department of Corrections employees. The lawsuit alleged that the Department of Corrections targeted Ms. Easley because of her whistleblowing activity and terminated her for being a victim of Sherrer’s extortion. The evidence revealed that no other victim of Sherrer’s extortion was ever investigated or punished. The evidence also showed that the Department of Corrections deliberately timed the termination Ms. Easley so that she would be removed just three months shy of her retirement in order to prevent her from collecting her full pension and retirement benefits. The FBI investigation concluded that Ms. Easley was a victim of Sherrer’s extortion. The United States District Court adjudicated Ms. Easley to be a victim and ordered Sherrer to pay restitution. Nevertheless, the Department of Corrections accused her of being a criminal and terminated her after her cooperation with the FBI and testimony before the grand jury. Although Governor Christie had stated at the time of Sherrer’s arrest that he expected that state criminal investigative authorities would investigate the corruption at the Department of Corrections, the evidence at trial confirmed that neither the State nor the Department of Corrections ever investigated anyone other than the targeted whistleblower, Ms. Easley. The jury awarded $265,778.00 in back pay, $1,000,000.00 in emotional distress damages and $6,500,000.00 in punitive damages. Ms. Easley’s attorneys, Alan H. Schorr and Arykah A. Trabosh, are pleased that the jury understood and properly compensated Ms. Easley for the egregious actions taken against her. Ms. Easley is grateful that a jury of her peers confirmed that the Department of Corrections acted unlawfully in taking punitive and career-ending retaliation against her. 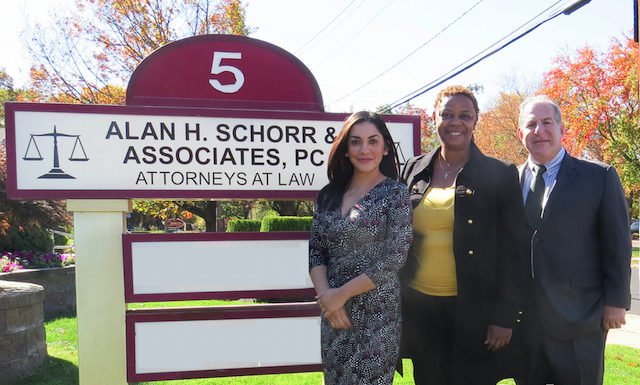 Schorr & Associates congratulates Lisa Easley, Alan H. Schorr, and Arykah A. Trabosh on their tremendous victory!